For many years the only dwarf Randika Cooray saw was the one in the mirror. Born with achondroplasia, Randika had a genetic condition that resulted in disproportionately short arms and legs. Short though they may be, Randika’s limbs didn’t let her down at the 2013 Dwarf Games held in Michigan, U.S.A. The biggest yet, the event brought together 400 dwarf athletes from 17 countries. Surrounded by people who struggled with many of the same problems she had, Randika rose to the top. While she was the only athlete to represent Sri Lanka, she did her country proud, stepping up to the podium to accept two gold medals for wins in badminton and boccia. Randika’s journey to the games was fuelled by a rare courage and passion and she’s come away determined to see more Sri Lankan athletes enter the arena alongside her next time. Until her daughter was born, Rosy Cooray had never encountered or even heard of a dwarf but she clung to the doctor’s reassurance that her little girl would be completely normal in every other aspect. It was a message she took care to pass on to Randika herself. Enrolled at Holy Family Convent, Bambalapitiya, Randika’s family encouraged her to lead a normal life. Randika remembers how her classmates would always look out for her, and appreciates that her teachers never treated her as different – she got the same punishments as everyone else. Out on the street though, it was a different matter. People would point and stare; some would even laugh or take photographs. Mrs. Cooray wanted her daughter to move about freely in the world and recognized that this would be the price. “Ammi would talk to me every night,” remembers Randika. “It was very, very difficult for me to cope, but she would say ‘you really need to know that you’re different but you can do everything that other people can do.’” Despite her family’s love and support, Randika struggled with issues of self-esteem and confidence. It was her interest in working with such children that brought her to the University of East London where she pursued a degree in special needs education with psychology. For the first time she moved away from her parents. Living with her two sisters who pushed her to be more independent, Randika began venturing out alone more and more. She found the world could sometimes be cruel, people screamed names, laughed and pointed at her. “I went through a lot but I gained a confidence,” she says. For her dissertation, she studied dwarfism, asking whether the condition was a disability or a difference. She concluded it depended entirely on the attitude of a person. lines as a young girl, Randika now joined various teams in playing sports from running to basketball to badminton. The courts and equipment were the regular size, only the players were smaller. Randika found a coach to help her improve her badminton game and began joining work out and game sessions with both disabled and mixed groups. Her 3’10” tall frame would sometimes protest under all this activity. Like so many other dwarfs, Randika struggled with back pain as well as swelling and an ache in her legs which are significantly bowed. The waddling movement with which she walks compresses the nerves in her back, but Randika doesn’t want the risk of surgery – “I love my sport and want to keep continuing it,” she says. To stay fit, Randika would go for regular sessions at the gym and paired these with classed on badminton. Her coach who was himself disabled understood her needs very well. In 2009, Randika was roped in for her first World Dwarf Games. Funding has always been hard to find as many companies refuse to support dwarf athletes. Randika has been lucky though with Rehab Lanka, the Sri Lanka Tourism Promotion Bureau and Alliance Finance of Sri Lanka who made it possible for her to represent her country. 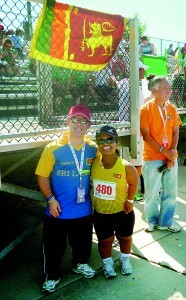 Travelling to Belfast, Ireland, she represented Sri Lanka in the 100m, 60m and badminton, winning a bronze in the 100m. With no one else from Sri Lanka, she was welcomed into Team Great Britain for the team events. It was a good year for Randika since she went on to represent team GB in the Four Nations Disabled Badminton Championship where she and her partner claimed the Silver in Women’s Doubles. She won the Silver again at the 2009 National Dwarf Games, this time for the 60m and 100m and a Bronze in the Badminton Singles category. Published in The Sunday Times, Sri Lanka on 18 August, 2013. Words by Smriti Daniel. Pix courtesy Randika Cooray.